The $750 (as of June 29, 2012) HP LaserJet Pro 400 Color MFP M475dw color laser multifunction lacks nothing in the way of hardware features. Its connectivity and paper handling are top-notch, though its capacity is just enough for a small workgroup (the printer's intended audience). It produces exceptional photo prints for the price, and its text is also quite nice. Its biggest drawback is its pedestrian speed. The M475dw features USB, ethernet, and Wi-Fi, so you may connect it in any way and any location you wish. A USB cable is included in the box. Setup is a breeze, and the 3.5-inch touchscreen control panel makes joining a Wi-Fi network, and performing other tasks, easy. The software that HP provides for scanning and OCR is excellent, and the driver is full-featured. The company's print-by-email ePrint functionality is available too. Paper handling on the M475dw is first-rate. Duplexing is automatic. Aside from the letter/A4-size flatbed scanner, the unit supports legal-size paper in every respect. You'll find a 250-sheet bottom tray, plus a 50-sheet all-purpose feeder that folds down from the front of the unit. If the M475dw's 300-sheet paper capacity doesn't cut it for your group, a bottom-mounted 250-sheet paper feeder is available for $115. A 150-sheet output tray sits on top of the MFP, underneath the scanner unit. The scanner component includes a 50-sheet automatic document feeder that can scan and copy two-sided to two-sided. The other notable physical features of the M475dw are the USB port on the front for printing and offloading scans, and the supereasy access to the toner cartridges. For the latter, you simply fold down the front panel, slide out a tray, and pop in replacements. The horizontal orientation means that you would have to try very hard to spill toner during the replacement process. Toner costs for the M475dw are a mixed bag: The black toner is a little pricier than average, overshadowing the cheaper-than-average color toner costs. The 2200-page black cartridge costs $84, or about 3.8 cents per page; the average is 3.4 cents per page. A higher-yield, $104 black lasts for 4000 pages, or 2.6 cents per page. The 2600-page cyan, magenta, and yellow cartridges cost $120 apiece, for a per-page, per-color cost of 4.6 cents per page. At its cheapest, a four-color page will cost you a middling 16.4 cents. An empty SODIMM slot behind an easily removed cover on the right side of the MFP allows you to upgrade the standard 192MB of memory. HP, of course, will sell you the part--for a cool $600. No, that's not a typo. A better option is to fill the slot with a standard 256MB DDR2 part that you can grab online for less than $50. The M475dw delivers average speed when printing color. In our tests, a 4-by-6-inch photo printed to plain paper at 3.3 pages per minute and to glossy photo paper at 2.0 ppm. A full-page color photo took 72 seconds (0.8 ppm). Monochrome pages, on the other hand, printed slower than on the majority of the competition, emerging at a rate of 11.6 ppm on our PC and 10.2 ppm on our Mac. The M475dw truly lagged in making copies, with only 2.6 pages arriving per minute. A barn burner it's not, but the M475dw's output is worth the wait. Text appears supersharp, and color graphics look very nice. Photos are excellent for a laser printer, and copies seem quite good as well. The unit has a bit of a problem printing fine curves, but that deficiency is noticeable only under close scrutiny. Scans of line art are merely fair, a result that is probably related to the issue with curves. The M475dw carries a one-year limited warranty and has a monthly duty cycle rated at 40,000 pages. The recommended monthly volume is 1000 to 2500 pages. The unit's construction seemed very solid in our hands-on, and it's a good bet that with careful maintenance, this MFP will outlive its warranty by a hefty margin. HP's LaserJet Pro 400 Color MFP M475dw is a solid product, with nice output, average toner costs, and middling speed. The company also sells a "dn" model that saves you $100 if you don't need Wi-Fi. If you're looking for alternatives, competing MFPs include the Oki MC561, Xerox WorkCentre 6505, and Brother MFC-9970CDW. 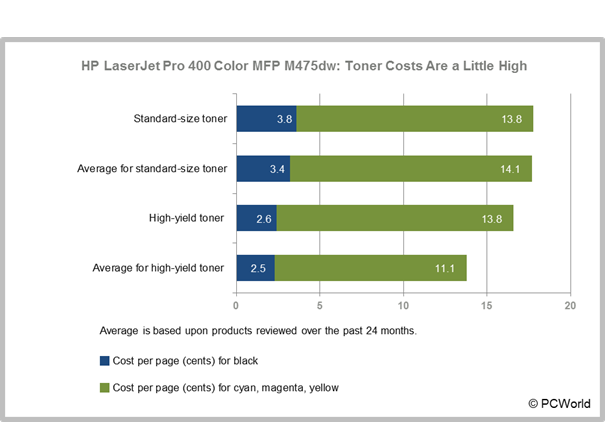 This office laser MFP offers great output and paper handling, but average speed and toner costs.